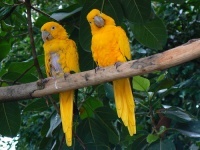 Situated in historic West Park on Pittsburgh's North Side, the National Aviary is a few minutes from downtown. It's the only independent indoor non-profit bird zoo in the USA and home to more than 600 birds of more than 200 species, many of which are threatened and endangered. There are birds from just about every corner of the world, from hummingbirds to Andean condors. The zoo places emphasis on rainforest and wetland habitats with most birds kept in natural planted exhibits, allowing for close up views. The National Aviary is a great family attraction in Pittsburgh.